Tenerife is one of those famous holiday destinations that automatically springs to mind when picking destinations. Year around sun doesn’t hurt either, which when you’re faced with the prospect of grey skies and rain, can certainly take on a certain charm. Head to the Canaries this winter and you’ll more than likely fly into Reina Sofia airport in the south of the island, with many great value deals to be had. Decrease travel costs even further with the godsend that is airport parking, saving precious Euros. I recently tried parking at Luton airport and was very impressed with the service and cost, so this is something I’d certainly recommend. Whatever resort you choose on the island, I’d suggest hiring a car if possible and really getting out and about in the countryside. 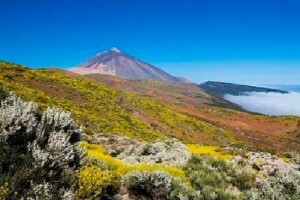 Tenerife has some beautiful sights, and one must visit is Mount Teide National Park. Don’t worry, the volcano is dormant, but the scenery is stunning and you don’t have to walk if you don’t want to – the cable car will do all the hard work for you. However, if you want to do some exercise, which I wouldn’t, then there are hiking paths also. Playa de las Americas and Los Cristianos are the two main resorts on the island, and its here you’ll find most in the way of tourism and night-life. Santa Cruz is an alternative and great for families, and its here you’ll find the best shops. The beaches on Tenerife are generally black sand thanks to the volcanic history of the island, however if this isn’t for you, the huge water-park, Aqualand, is a great alternative, and another is a boat trip. I’d highly recommend this, especially the glass bottom variety, where you’ll see all manner of interesting underwater residents. Water-based activities, shopping and nature aside, Tenerife offers great night-life too, with family entertainment in resorts and hotels, and the best of the action in the two main big hitters – Los Cristianos and Playa de las Americas. Food-wise, nobody will go hungry, as Tenerife’s main resorts are quite British when it comes to food. However, if you do get the chance, give some traditional Canarian food a try, but beware that it tends to come topped with the famous red mojo sauce – extremely spicy! Tenerife is varied, bright and offers something for everyone, no matter what level of intensity you’re after. To really kick-start your holiday, I’d recommend seriously looking at airport hotels. I tried this idea recently and I’m a new convert, as its perfect when you have an early flight. I boarded my plane feeling refreshed and ready to hit the beach, not frazzled before take-off. I stayed at one of the Manchester Airport hotels and would definitely recommend them. It’s certainly tempting to head to the sun when the winter temperatures kick in and the skies are permanently grey, and Tenerife is a great choice of destination, for something less long-haul, with all the perks of home. With so many resorts to choose from, you’re bound to find one to suit.